While I have a few of Deanna Raybourn's novels on my shelves, Night of a Thousand Stars is the first of her books I have read. My first thought after finishing it is....what have I been waiting for?! Starting out with our heroine Poppy leaping out a window to escape a marriage she does not want, the action does not stop as Poppy follows her gut in search of Sebastian, a man she barely knows but who she believes must be in trouble, all the way from London to the Middle East. Hijinks of course ensue with Poppy diving head first into trouble and learning that no one she encounters is who they seem. While the romance that develops between Poppy and Sebastian is somewhat predictable and typical (they are attracted to each other while simultaneously infuriating each other, neither want to give up ground and always want to be right, etc.) it was enjoyable watching them spar against each other until they have to work together to survive. The secrets Sebastian is hiding aren't overly hard to determine either but I was pleasantly surprised to see the more comic elements of the novel shot through with some more serious and graphic elements that drive home the serious danger Poppy comes to find herself in. The ending of the novel came as a complete surprise to me, which I always find delightful! For those who have read Ms. Raybourn's Lady Julia series this might not be as big a surprise as apparently characters from that series make an appearance in Night of a Thousand Stars but for me I was excited to see the mysteries all wrap up nicely and to see it left open for Poppy to continue her adventures in future books now that she has found a purpose for her life in a field that we learn is apparently a family tradition of sorts. I am also now really excited to read the Lady Julia series to connect all the pieces I missed! 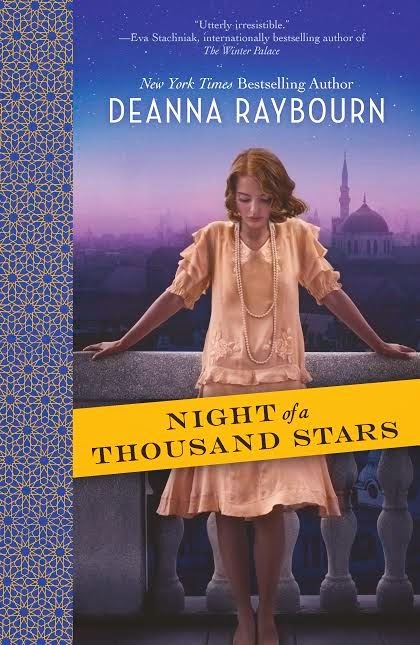 With well drawn characters, excitement and adventure abounding and just the right touch of romance thrown in for good measure, Night of a Thousand Stars is a thoroughly enjoyable way to while away the hours and draw yourself out of your own world into the world of 1920s London and the Middle East. 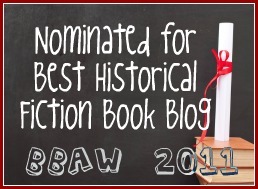 I would recommend this to anyone who enjoys historical fiction and a plucky, determined heroine. It's very pretty! I love the colors and the fact that Poppy is standing out on a balcony with that spectacular view behind her (as happens a number of times in the novel). My only complaint is that I would have preferred either seeing Poppy looking out at the view or facing us looking up into the eyes of the reader with all the determination and spunkiness that her character exudes within the pages. Thank you to Amy at Historical Fiction Virtual Book Tours for providing me with a free copy of Night of a Thousand Stars in exchange for an honest review! Make sure to continue below for more information on the book, the tour and your chance to win a copy of your very own! college sweetheart. She married him on her graduation day and went on to teach high school English and history. During summer vacation at the age of twenty-three, she wrote her first novel. After three years as a teacher, Deanna left education to have a baby and pursue writing full-time. Thanks Rhonda! I hope you enjoy it when you get the chance to read it! I've read all the Lady Julia series and loved the stories and the characters, esp. Brisbane. I also really enjoyed Spear of Summer Grass. Thank you for the recommendations Linda! 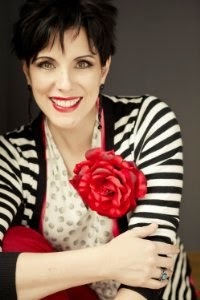 I added the first Lady Julia book to my wishlist....I figure I should start at the beginning :). I actually have Spear of Summer Grass at home but haven't had the chance to read it yet. I need to make time to do so! Oh wow....I love a beautiful cover for sure! I'll need to add this one to my wish list as well. Thanks Amanda! Thanks JJT! I hope you enjoy it! The Lady Julia series is my favorite, starting with Silent in the Grave. Thank you Nancy, I believe that is the Lady Julia book I put on my wish list. Everyone seems to love it so I need to check it out as soon as I can! All of Deanna Raybourn's books are great. If you are in the mood for Victorian London, try the Lady Julia series or Africa in the 1920s, try A Spear of Summer Grass. I am a huge Deanna Raybourn fan and I started with Silent in the Grave. It's my favorite for sure. The whole Lady Julia series is a treat. I have read all of her Lady Julia books and all of these set in the '20s. It's a toss up b/c her Spears of Grass is good, but I guess I'll suggest the first Lady Julia b/c that came first. II haven't read any books by this author yet, but this one sure has a beginning to grab anyone's attention! I haven't read anything by this author, but this one sounds very good! Hello all! Thank you so much for entering to win a copy of Night of a Thousand Stars on Historical Tapestry! Using a random number generator the winner is....Kim@Time2Read!!! Kim, I will send you an email now and you will have 48 hours to respond with your mailing address before I have to pick another winner.